This Post has already been read 1112 times. 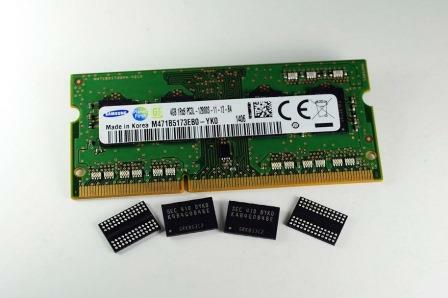 Samsung Electronics Co., Ltd., the world leader in memory technology, announced that it is mass producing the most advanced DDR3 memory, based on a new 20 nanometer process technology, for use in a wide range of computing applications. Samsung has pushed the envelope of DRAM scaling, while utilizing currently available immersion ArF lithography, in its roll-out of the industry’s most advanced 20-nanometer (nm) 4-gigabit (Gb) DDR3 DRAM. With DRAM memory, where each cell consists of a capacitor and a transistor linked to one another, scaling is more difficult than with NAND Flash memory in which a cell only needs a transistor. To continue scaling for more advanced DRAM, Samsung refined its design and manufacturing technologies and came up with a modified double patterning and atomic layer deposition. Samsung’s modified double patterning technology marks a new milestone, by enabling 20nm DDR3 production using current photolithography equipment and establishing the core technology for the next generation of 10nm-class DRAM production. Samsung also successfully created ultrathin dielectric layers of cell capacitors with an unprecedented uniformity, which has resulted in higher cell performance. With the new 20nm DDR3 DRAM applying these technologies, Samsung also has improved manufacturing productivity, which is over 30 percent higher than that of the preceding 25 nanometer DDR3, and more than twice that of 30nm-class* DDR3. In addition, the new 20nm 4Gb DDR3- based modules can save up to 25 percent of the energy consumed by equivalent modules fabricated using the previous 25 nanometer process technology. This improvement provides the basis for delivering the industry’s most advanced green IT solutions to global companies. According to market research data from Gartner, the global DRAM market will grow from $35.6 billion US dollars in 2013 to $37.9 billion US dollars in 2014.